Good morning friends! It's a glorious morning here on the farm! The sun is shining, the sky is blue, there's a soft, beautiful breeze blowing, and the birds are singing. Sounds pretty heavenly, right? Well it IS!! Those singing, happy birds are also loving the bird bath this year. With the shortage of rain we're having, they look for every low spot they can find with ANY water in it at all, and they have a heyday in it. This image makes me think that THIS little birdie found an empty bird bath, 'cause he don't look so happy!! Heehee! I LOVE that grouchy look! It's just too funny, and the sentiment with it just makes me smile. I can't help it. It just does! 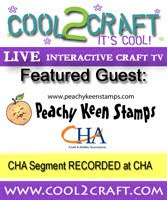 The stamps for this card come from the new release at Peachy Keen Stamps. This is the PKSC-06 stamp set, which includes this adorable bird, and birdbath, but there's also a turtle, frog, fairies, flowers and sweet faces to coordinate with everything. It's a party in a package, I'm tellin' ya!! I also used one of the new background stamps on this card. For the contrasting gray panel behind the bird image, I took a piece of the more solid patterned paper from the 6x6 pad in the Peachy Picks Kit and stamped it with a tone-on-tone gray using the PK-119 Lattice Background stamp. That just gave it a subtle bit of pattern, which I thought was a nice contrast to the striped patterned paper. All of the card stock and patterned paper, as well as the beautiful twine are a part of the June Peachy Picks Kit. I just can't say enough times how much I LOVE these kits! Everything is so perfectly coordinated, and there's so much included for so many amazing projects that you've just got to see it to believe it!! I stamped the images and I didn't even need to mask anything, because Peachy Keen Stamps are completely clear, which makes aligning the images a breeze! That's just another in the long list of things that I love about them!! Thanks for visiting today. I hope your day is filled with beautiful blessings and definitely some happy stamping! Cute card. Your coloring is just amazing. Gorgeous card with that great, funny image...fab coloured and I love the shape of the die! Adorable! I am loving how you colored that bird bath! Beautiful card! !